I have been volunteering at Food & Friends for just 2 years now. In that time, I have worked mainly in the kitchen and in the development office on special events, but have had occasion to work on projects in most all departments in the building. A recent email message from Volunteer Services Manager Beth Stewart caught my eye. 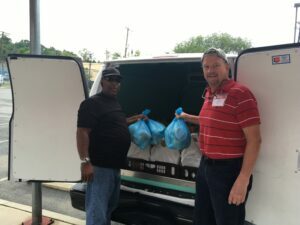 It was about a new volunteer position, “Delivery Jumper.” This assignment involves going out on a daily run with one of the staff drivers, delivering prepared meals and groceries-to-go to the homes of clients. I was intrigued because very few of my previous volunteer experiences had involved client interaction. While I had done just about every volunteer task within the building, I hadn’t taken the step of going out on delivery by myself. So, I decided to give it a try. Beth assigned me to work with staff driver Antoine Johnson. We met on the loading dock that morning, loaded up his van, and headed out. Antoine knew the routes and the clients well, and I was able to help by jumping out of the van and delivering the food to the client, their family member or caregiver, while Antoine called the next home to let them know we were on the way. We made over 40 deliveries that day to the northeastern and southeastern section of the District. In some cases, the client asked me to relay a message back to Antoine, like “don’t let him forget my birthday cake next week,” showing the personal connection he has made with the clients on his route. I must say that having Antoine as my driver and “teacher” that day made the time go by quickly. His warm and engaging personality, tips about shortcuts to improve his efficiency, and anecdotes from his past experiences as a driver, made for an enjoyable day in itself. It was a full day, and my muscles were tired that evening…but a “pleasant” tired. More importantly, it was an extremely heartwarming yet humbling experience to approach the front door of home after home of individuals you know to be living with a life-challenging illness, and to be met with a warm smile and a “thank you” in each case. Having spent many hours preparing and packaging food in the kitchen on Riggs Road for clients that have been faceless until now, my day on the road with Antoine brought my Food & Friends experience full circle. It reinforced in my mind the critical value of what we all do together at Food & Friends day after day, week after week, year after year. I encourage my fellow volunteers to take advantage of this new opportunity. I’m doing it again next week. Note: If you are interested in volunteering as a Delivery Jumper, please contact volunteer@foodandfriends.org or call (202) 269-2277. We’d love to have you!